Daddy I want to thank you for this great privilege. Precious Redeemer we want to say thank you for this rare privilege. Thank you for this set time. Thank you for what you are set to do in our days and in our generation. Your Word says: eyes have not seen it, ears have not heard it. Father we are privileged. Thank you Heavenly Father. I hide myself behind the Cross; that you will Glorify yourself today. Thank you Precious Redeemer. In Jesus unfailing Name we have prayed. Amen. If I have an Indomitable Young Adult and Youth in the House, can you jump on your feet and shout hallelujah! … Now, see I am from the North. I am a Northerner. And there is a way we shout. 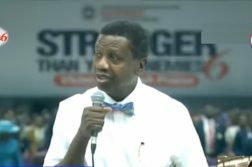 Now, if you know that truly you are an Indomitable Youth who is set for Revival; who has been incorporated in the cause of this Convention: can you make a joyful noise to the Lord. You will shout for joy, in the Name of Jesus. I want to speak on: INDOMITABLE SOUL WINNER. Can I say something into your life; for the fact that you are hearing (reading) this message: “The devil will always come BEHIND; he will never be ahead of you, in the Name of Jesus. When we say Indomitable; we are talking about to SUBDUE. There is a kingdom that our Father: the God of Heaven and Earth has given to us to be in charge. The devil however will never want us to take charge of that kingdom. And so he will allow us do different kind of things: thoughts, and doctrines; to come into us in other to persuade us out of the Truth. But the Bible says: this certain man “called to himself”. Friends, God gave our father in the Lord a word that: “God is raising an army that will SUBDUE the land”. An army that will go after souls. An army that will go all out, not minding what they will have or will see. And he said: “fortunately, those army are the Young Adults and the Youths”. It you are one of those army can I hear you make a joyful noise to the Lord. 1. They must dare every kingdom or authority; must war whatever people are saying against God in the land. Some years back in Kaduna; during the Sharia. People were called to support or be against it. I went to Kaduna. I was the only one in the midst of several of them. And when it was my turn to speak ; first thing I did (to gather strength within me): I shouted “Praise the Lord” ( I didn’t hear any sound of hallelujah). I shouted again, there was no responds; I said Lord, into your hand I commit my spirit. And the third (3rd) time I shouted “Praise the Lord” I heard shouts of hallelujah. Friends, the people that must take the kingdom must dare every constitution; every word that is Anti Christ. And in our lands, such abound. Friends, when will you STAND for the cause of the kingdom? 2. They are Confident in their God. Daniel 3:16-17. 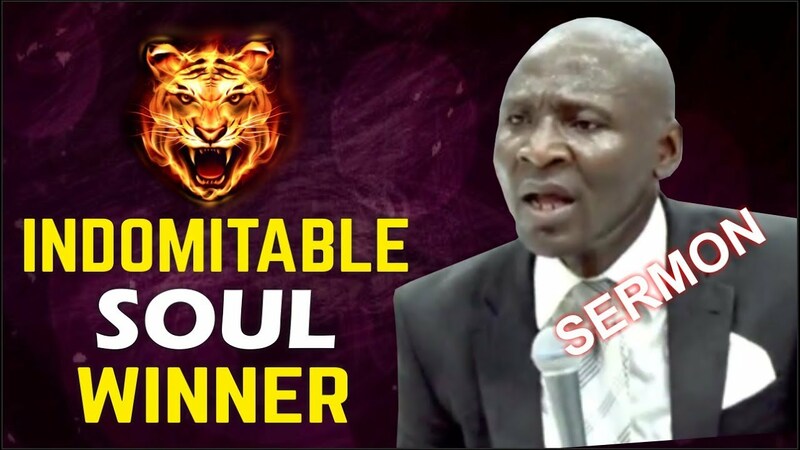 The Indomitable Soul Winners are confident of their God; knowing fully well whatever people say, whatever will happen: they know that their God will deliver them Victory. 3. God easily “SHOW UP” for Soul Winners. Daniel 3:25. The king said, how many people did we throw into the furnace; were they not three (3)? But I can see a fourth man that is looking like the Son of God. Excuse me, he was an infidel; he was a man that knew NOT God. How come that an unbeliever could have a revelation? Friends, what are you doing? You are a Christian, and yet you can’t discern. The unbeliever king was able to discover the fourth (4th) person; even when it was not yet time for Jesus to manifest physically. 4. Their TESTIMONIES always bring Revival. When these people stood for God, God showed up for them; God came through for them. Friends, I want to ask you: ever since you have been a believer; how many souls have you won for the cause of the kingdom? From January till date; how many people have you spoken to regarding the things of the kingdom? 2 Corinthians 5:11 says: Knowing therefore the TERROR of the Lord, we persuade men; but we are made manifest unto God; and I trust also are made manifest in your consciences. Paul said; I know the TERROR of God. We persuaded men. Uncle/Aunty do you know the TERROR of God? Sir/Ma, you don’t witness to people because you don’t know the terror of God. You don’t witness because you don’t know where people will end up. We are not talking about church here. We are talking about the KINGDOM. Let me ask you again; how many times have you taken people willingly to go out and witness? How many times? These people dared for the kingdom. Paul, for example knew that going to Rome will end his life; but again and again he prayed that he wanted to go to Rome. Against all odds he was ready to die for the cause of the kingdom. It is said that the man that sang that song; the song was sang on his dead bed. He had no opportunity to minister to people (But he refused to die); Thank God for mercy that sorted him out. And that song has been a cause of Revival in our land. Paul said: knowing the terror of God! Excuse me, what is the Terror of God? The Bible says concerning hell that it is where people will be forever and ever gnashing their teeth. Those who are there just now; it is yet the beginning! Friends, the Bible says: who shall ascend to the hill of the Lord; or who shall stand before His Holy hill? He that has a CLEAN hand and a PURE heart. Friends, are your hands CLEAN? Because God will not commit Himself to someone whose hands are not clean. Are your hands clean? Why is there no Revival in the land? Why is it that the OTHER side is wining? Excuse me, years back if you go to the Southeast you would hardly see a mosque. Today, it is a different ball game. They are strategising; and you are here playing Church. You are after Titles. You are after Positions; instead of working after the cause of the Kingdom. Oga/Madam, what did Sarah know? What did Rahab know? An harlot yet, she became the Great Grandmother of the Saviour; because someone was able to minister to her and she accepted the Lordship of the God of Israel. I ask you again, what is wrong with your Faith? Sound doctrines, nobody wants to hear. Issues of holiness nobody wants to listen. Issues of consecration, nobody wants to listen to. Friends, if you miss the opportunity of surrendering your life and rededicating your life; it will be a pity. Let me ask you again; in the cause of the old year crossing over into the new year. Almost everyone had a request of what you wanted God to do in your life. But did you ever have something you want to do for the cause of the Kingdom? … Until you satisfy Him, there is no way He will satisfy you – They were willing to die for the cause of the Kingdom. Excuse me, what you see the other people doing that people will call extreme (whether you say Boko Haram, etc). Permit me to say; Christians, specially the Young Adults: we are supposed to be Radical for the cause of the Kingdom. And if there is anyone here who will want to take a be step that from this Convention: “I will become an addicted Soul Winner”. Can you jump on your feet and shout hallelujah. Friends, when will you wake up from your sleep? On the Social Media, there was a lady who was giving the testimony of people that came to meet her to accept the gospel of Satanism. So it is no longer news that Satan has recruited people to go and minister to win souls for him. And you that have the Gospel of the kingdom; you that are in the Kingdom: you are living the way you like. The soul you refuse to preach to, may end up being the one that may end your life or the life of your children. That the person kills you (because he murder); does not guarantee that you will go to Heaven. … You are going to hell straight. And if that same man confess and get converted; he will be saved. And your soul will languish in hell. The children will always follow after the pattern of their father. And our Daddy in the Lord has been a good example. Friends, there is a burning in my heart; there is a craving in my heart. Sir, they don’t care whether they have money or not. 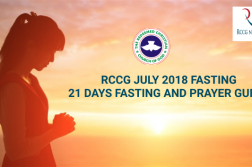 I give this testimony to the Glory of God (Central Missions Board will bear me witness): I was so passionate to go for an Outreach in Sierra Leone, and I had no enough money; but I have made up my mind to travel. I met my Pastor In Charge of Province, FCT 11; he gave me some money. I had to enter from Abuja to Lagos (night journey). I did five (5) nights and four (4) days on the road all through (with joy in my heart). Sir/Ma, the longest Bike I will ever ride on was eight hours thirty minutes. As a matter of fact, I had no money again. I had to sell my phone in other to move (yet, there was this joy in my heart). What can you surrender for the cause of the Gospel? The Disciples of Christ; they laid down their lives. They were crucified. They were killed: yet they never cared. You say you are crucified with Jesus; If truly you are crucified with Him why can’t you witness to friends? How can you stay a whole year/month/week and you are unable to speak to one soul? The man that sang this SONG: “I have decided to follow Jesus”. I want to make a call; you are a young person here. The prophecy that God gave our father in the Lord, you want it to be fulfilled in your life; you want to join us as we take the Gospel to the ends of the earth. 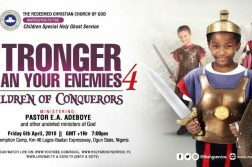 You want to join us for this project: “1.5 Million souls to be won between now and next year Convention”. Are you one of them, can you come out now! You are one of those that want to lay down your lives before Christ: that Christ will lift up. Can you come out! Come out my friend; Jesus is raising champions that God will use to dominate the kingdom of hell. The Lord Jesus wants to engage you! For you to become an Indomitable person; Soul Winning is non negotiable. In the beginning of this year; while leading the people to cross into the New Year, I decided to enter into a covenant with God. I said to God: between then and the end of this year, I want to win one thousand (1,000) Souls for you. What decision have you made for the cause of the kingdom? That your Grandmother/Grandfather you refuse to minister Jesus to; she will say Moses/ Titilayomi; you are wicked. You knew there was Heaven and you refused to tell me. Your Uncle/Aunty you are only giving money to, will say: you are wicked. You only gave me money but did not give me Jesus. Oh God, if you will not show us mercy who will? Where will Mercy come from if you will not show us Mercy? Daddy please come and pray for us. Daddy did not stand; told him to go ahead – daddy later said he also needs prayer. Jesus have Mercy on us. Thank you Jesus. Lord, I am not worthy to do this prayer. I am not fit; because I personally am the least qualified. Oh God…..; oh God, oh God! Mercy, Mercy, Mercy! Show us Mercy oh God. Like you prayed for Peter; Lord please pray for us. Like you helped Peter; Lord please help us. The uncultivated lands that we have left that have grown several nonsense. Lord we repent in ashes. The people that we should have witnessed to and we never did (and they have died); what else can we say: have Mercy Lord. Please Lord be merciful to us. As we rise up as people determined; every week at least to witness to one (1) Soul. Father, passion for Soul Winning baptize us with it. Passion to become incurable Soul Winners, please baptize us with it.